The business jet industry’s near-term outlook is counter-intuitive. “Common sense dictates that as more jets are sold the industry’s total shipment values go up. That may no longer be the case for the time being” reveals a new forecast from aviation analyst Brian Foley. Worldwide business jet shipments toppled from a high of 1317 units in 2008 to a measly low of 672 in 2012. As to be expected the combined dollar value of these deliveries decreased in concert. 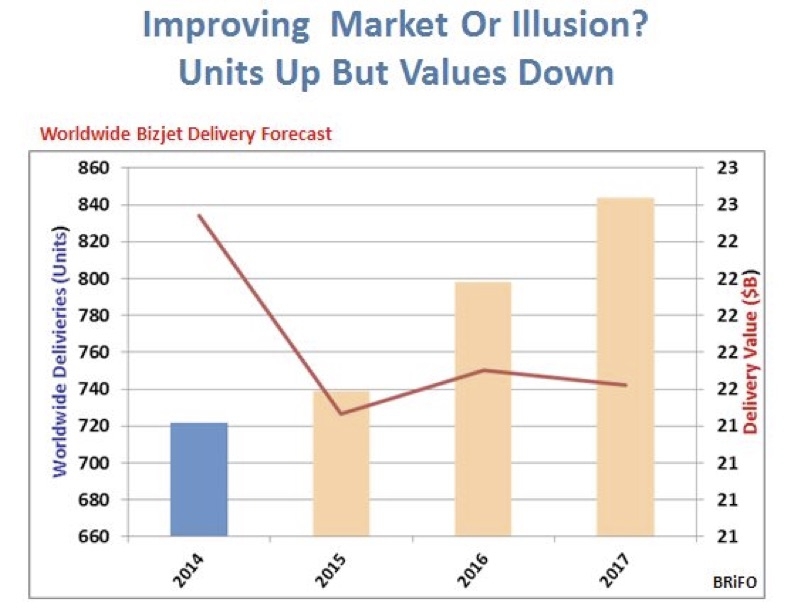 Foley believes that beginning this year, contrary to conventional wisdom, the number of units delivered will continue to track upward as they have been with one notable exception — total shipment values may actually decrease or remain flat. The reason, states Foley, has to do with a change in the mix of aircraft that will be sent to customers. Referencing his September 5, 2015 press release on weakened demand for the biggest, most expensive jets, Foley reasons that future shipments will contain a greater proportion of less costly small and medium jets. Thus, even though more jets will be built their average retail values will be less as the sales center of gravity shifts towards the lower end of the market.